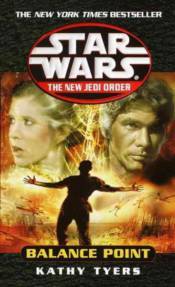 "In the aftermath of one tragedy, will a young Jedi's search for redemptionlead to yet another? There is no place else to channel the flood of refugees fleeing the murderous Yuuzhan Vong but the overcrowded planet Duro, poisoned by centuries of technological excess. Fortunately a deal is struck: In exchange for a new home, the refugees will work to restore the planet to health, under the watchful eye of Leia Organa Solo. While tempers flare between the Duros and the New Republic, Han Solo, his son, Jacen, and the Ryn called Droma arrive to keep the peace. They are unaware that Leia is on Duro . . . and that Luke, Mara, and Anakin are on their way, searching for a missing Jedi apprentice. And none realize that the Yuuzhan Vong have chosen this embattled planet as the next target in their brutal coreward thrust. Now, as the fragile stability on Duro threatens to collapse into violence, Jacen Solo must face his greatest dilemma: At what point does the use of power become aggression? Whatever he decides, his next step could tip the galaxy's destiny toward the light or toward darkness-with the life of someone he loves hanging in the balance . . .